The ScreenSteps documentation can be downloaded for offline viewing. 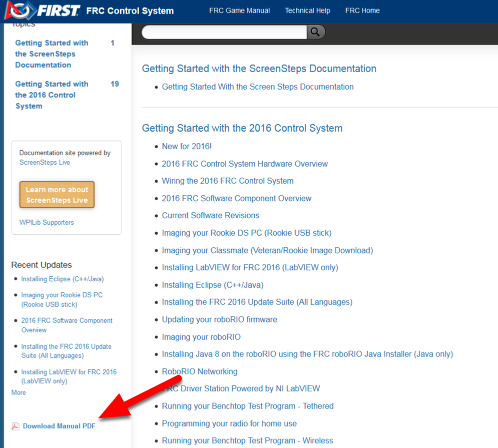 At a minimum you will want to get a copy of the Getting Started with the Control System manual, you may also wish to download some or all of the other manuals as well. The link to download the PDF of a Manual is located on the left sidebar of the Manual page or any Lesson in the Manual. See Getting Started With the Screen Steps Documentation for more details about the ScreenSteps site and content organization. A number of software components were broken out of WPILib in 2017 and are now maintained by third parties. See this blog for more details. A "directory" of available 3rd party software that plugs in to WPILib can be found on this page.